Start Visual Studio and Click New => Project. 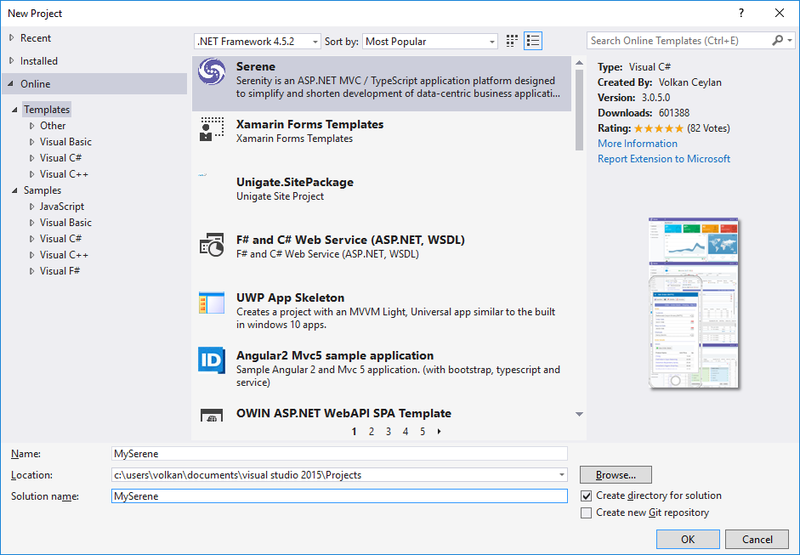 Note that this application template requires Visual Studio 2012 or higher. Make sure you have the latest Visual Studio updates installed. In the New Project dialog box Recent, Installed and Online sections will be shown on left and Installed is the active one. Click the Online section and wait a bit while Retrieving information message is on screen. Please wait while it is loading results. Serene might be already showing on top of the list. If it is not, type SERENE into input box with Search Online Templates label and press ENTER. 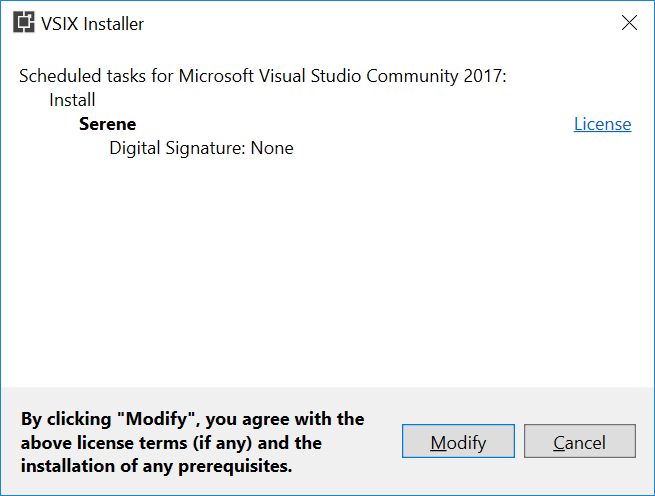 After you create your first project, Serene template is installed into Visual Studio, so you can use the Installed section in New Project dialog to create another Serenity application. 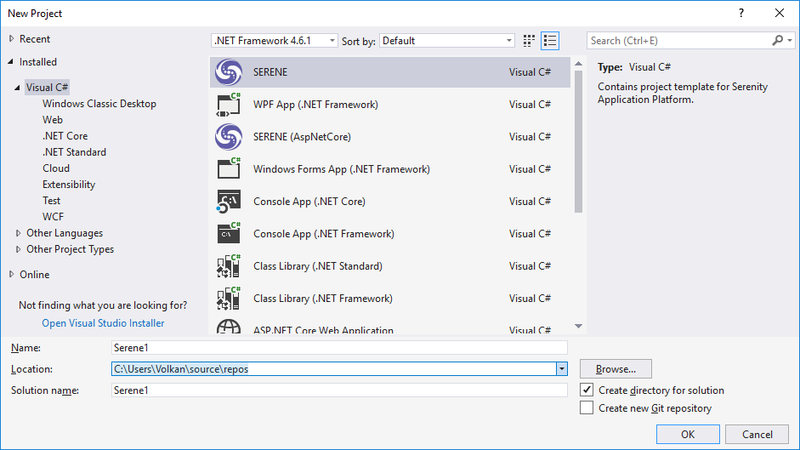 Your project will use ASP.NET MVC 4 version of Serene, next time you may choose ASP.NET Core version from New Project dialog, Installed section. When you click Modify, you&apos;ll be asked to terminate Visual Studio and other related processes. After installation, Visual Studio won&apos;t restart itself. You&apos;ll have to manually relaunch Visual Studio. Unfortunately, this is a VS2017 bug. We have two versions of Serene template. One that uses classic ASP.NET MVC 4 (SERENE) and another one that works on ASP.NET CORE 2.0 / .NET CORE 2.0. 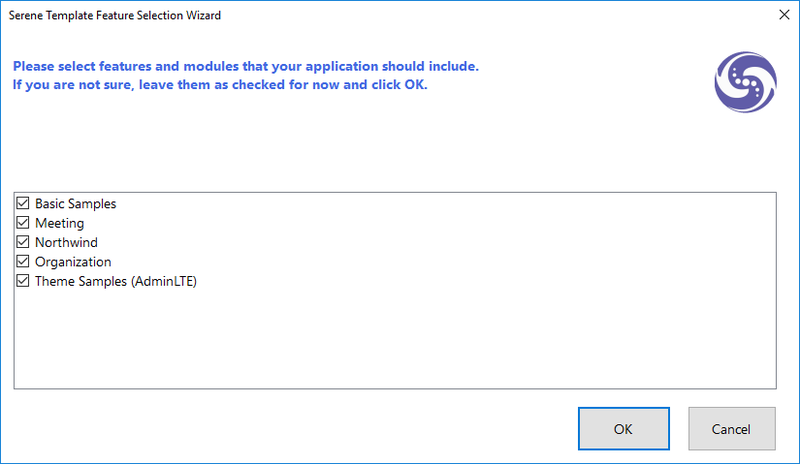 Unfortunately Visual Studio 2015 doesn&apos;t let you choose which version to use on first install. But, you will see ASP.NET Core version after installation on New Project dialog.